In the event an emergency arises and you need to call 911 we are here to help. Due to the sensationalism of crime TV and movies there are many common misconceptions which have been raised causing the general public to believe we know things we do not when we take your calls, such as knowing your location when you call in from a cell phone. This is simply not the case. Below are some common misconceptions and how it really works when we answer your 911 calls. When you call 911, the call is routed through a dedicated network to the appropriate Public Safety Answering Point, or PSAP, for the caller's location. Click on the title heading "How 911 Really Works" if you would like see further detail on how exactly your call is routed to a 911 Dispatch Center. If we do not know where you are, we can't help you! If reporting an emergency from a cellular phone, it is important we have as much location information as possible, including city name, street names, direction you are traveling (i.e., north or south) and nearby landmarks (i.e., a shopping center or restaurant), so emergency responders can locate and provide assistance more effectively. If you do not know where you are, neither do we. Help us, so we can do what we do best and help you. Answer the dispatcher's questions, do not hang up until the dispatcher has what they need to get you help and listen carefully to our instruction. We are trained to ask specific questions in order to help you and get you assistance as quick as possible. We will prioritize your call based on rankings determined by Adcom911. The calls are then dispatched in order of emergency. Emergency calls always take priority and are dispatched first. Should you accidentally call 911, do not hang up. Just let us know you accidentally dialed because it saves us more time if we know it was an accident right away versus us taking the time to call you back to make sure you are okay when there may be someone calling in with a real emergency. To date, Adcom911 has received approximately 25,000 pocket dials to our 911 dispatch center over the last year and those numbers are steadily rising. Should you accidentally call 911, do not hang up. When a call is placed to 911, it is still routed through to 911 even if you hang up. Please stay on the line and let us know if you accidentally dialed or pocket dialed. Otherwise, we will call the number back to make sure you are okay and this can waste valuable time for others who are calling in need of emergency assistance. Additionally, many people allow their children to play with cell phones they no longer use as a toy. This has caused a dramatic rise in calls to 911 with a small child being the voice on the other end which ties up the 911 lines until we can determine if it is an emergency or not. If you are going to allow a child to play with an old cell phone, please supervise them while they are playing with it so you can make sure they are not calling 911. This is your best choice when calling 911. The phone’s address and number will always be displayed for the 911 dispatcher. These private phone systems may not interface with 911 to provide automatic location and number identification and routing features. Also, a caller usually needs to dial “9” for an outside line on most business phones. Dial carefully; many accidental 911 calls are received from businesses that have to dial “9” and then “1” for long distance. Voice over Internet Protocol, or VoIP, phone service allows you to make and receive calls using an Internet connection. You may not even realize that you no longer have landline phone service because many providers simply call it “home phone service.” It’s usually bundled with internet and cable service. A VoIP phone location must be registered. Check with your service provider on how to register your address and to determine the level of emergency calling features available. If your phone is not registered, 911 calls may not go to the correct 911 center. When the power is out, so is your phone. VoIP requires power. Even though VoIP phones have batteries, they will only last a few hours. If you travel with your VoIP adapter, your 911 call could be routed to the wrong state or country if you don’t remember to update the address. Call from another phone, preferably a landline. Be an informed consumer. When considering switching from traditional landline service to VoIP, be sure to read the fine print. Realize that the 911 service you have come to rely on may not work the same with this new phone service. It is the ability to send a "short message" (SMS) or other kind of text message to 911. But if you are able to make a voice call to 911, and if it is safe to do so, you should always make a voice call to 911. When Text-to-911 becomes available for the areas in which Adcom911 serves it will be announced accordingly. The Adams County Communications Center (Adcom911) has recently enabled the ability to receive 911 Text messages. Adcom911 provides emergency call response to the following jurisdictions: Unincorporated areas of Adams County, and the Cities of Northglenn, Brighton, and Commerce City; and also the fire jurisdictions of Adams County ​Fire, South Adams County Fire, Brighton Fire, and North Metro Fire. A caller reporting an emergency from the deaf or non-verbal community. Situations when silence is of the utmost importance for your safety – instances of intrusion, abuse or other dangerous situations in which making a phone call would escalate the emergency. 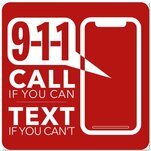 If a text to 911 is made, it should be simple and to the point with no abbreviations. Dispatchers will not automatically receive the text location so it is imperative to include an accurate location or address in the text message as quickly as possible so responding units can be quickly dispatched. Across the country as Text to 911 becomes available the phrase: “Call If You Can. Text If You Can’t” is the recurring theme. Voice calls to 911 continue to be the most efficient way to reach emergency help. During voice calls the Dispatcher is able to quickly ask questions and obtain information from the caller, while two-way communications by text can take more time both in typing the message and responding to a message. Please click on the following link if you would like to register your phone to receive emergency notifications from Adcom911 or learn more about the CodeRed emergency notification system. 911 is to be used ONLY in emergency situations. An emergency is any situation which requires immediate assistance from the police/sheriff, the fire department or an ambulance. Call 911 to stop a crime, to report a fire and to save a life. Of course, if you are ever in doubt of whether a situation is an emergency you should call 9-1-1. It is better to be safe and let the 9-1-1 call taker determine if you need emergency assistance. However, there are simply things we do not have access to and would not be able to help you with which could cause a delay in emergency services for those who do need it if you are not calling in an emergency. NEVER prank 911! Just don't! Parents should teach their children what 911 is, how to dial from your home and cell phone, and to trust the 911 call dispatcher. The child should be physically able to reach at least one phone in your home. When calling 911 your child needs to know their name, parents’ name, telephone number and most importantly their address. Tell them to answer all the dispatcher’s questions and to stay on the phone until instructed to hang up. Never practice calling 911 on a real phone. Press “9”, then ”1” and then “1” again. Tell the 911 dispatcher what the emergency is: someone is hurt or sick and needs help, there’s a fire or someone is trying to break into my house. Listen carefully to the 911 dispatchers questions and answer them to the best of their ability. Remind them that the 911 dispatcher can’t see them shake their head or point their finger, so answer the questions verbally. Follow the 911 dispatcher’s instructions and stay calm. Help is on the way.